You may have noticed that many of the rattlesnake species demonstrate colors and patterns that blend well with their environment. This cryptic coloration helps to conceal them from their prey and from other snake-eating predators. The snakes best defense is this ability to "disappear" among the rocks, soil and vegetation. Many tree dwelling snakes are green to blend with the foliage. The Mottled Rock Rattlesnake is found in the far southeast corner of New Mexico, southwestern Texas and south to central Mexico. It is unlawful to capture or keep this species without written authorization. This snake gives birth to an average of four babies in a litter. 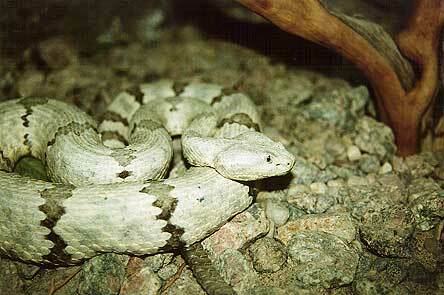 Some larger rattlesnake species give birth to as many as 25 young. All rattlesnakes are born alive.